Senior Devon Metcalf tags out St. Joseph’s runner at the base. The Dragons are heading to Auburn, Al. to compete in the War Eagle Classic March 9-14. Some of the competitors they will face include Louisiana Tech University and Georgetown University. 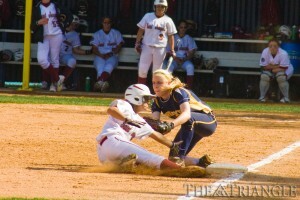 The Drexel softball team (3-8 overall) has gotten off to a rocky start, but the season is still young, and the Dragons have time to resurrect it. The team traveled to Lawrenceville, N.J. March 6 to challenge Rider University (2-9 overall) in a doubleheader. Senior pitcher Hillary Allen got the start for Drexel in the first game of the doubleheader against Rider. The game started as an intense pitchers’ duel with both teams unable to get a hit until the third inning. The Broncs finally broke through in the fourth inning with the game’s first run. Rider freshman Gina McCool got things started with a double. Then, junior Alyssa Paul grounded out to second but advanced the runner to put the go-ahead run 90 feet away. Junior Sam Pugh then hit a double to score McCool, leaving the Dragons down 0-1. Rider’s senior pitcher, Rachael Matreale, managed to bring a no-hitter into the fifth inning, when junior Hanna Parrish was able to get Drexel’s first hit. The Dragons would only manage one more hit in the game, while Rider would score one more run in the fifth inning to secure Drexel’s 0-2 loss. Sophomore Shelby Taylor started the second game of the doubleheader and got early run support. Parrish led off the game for the Dragons by hitting a triple to left-center. Senior Devon Metcalf then flied out to left field, while Parrish tagged up and scored to give Drexel its first run and first lead of the day. The Dragons managed to score a run in the second inning as well, following an interesting series of events. After singling with one out, senior Caprice DeMirjian advanced to third on a throwing error by McCool. With DeMirjian on third and freshman Sylvia Llamas on first, Drexel performed a successful double steal to widen the lead to 2-0. Drexel continued to pour it on the in the third inning by scoring two more runs. Metcalf led off the inning by drawing a walk and stealing a base, while senior Paige Collings also drew a walk to set up head coach Kim Camara’s next aggressive call. Camara called for another double steal and was successful, but the throw from the catcher to second base sailed into center field, allowing Metcalf to stroll home for another run. Rider would then load the bases with two more walks and allow a line drive single to center by DeMirjian to drive home Collings. Rider escaped the rest of the inning without any more damage, but the Dragons left with a 4-0 lead. Success continued for the Dragons in the fourth inning with two Rider errors leading to two unearned runs. They added another run when Collings hit a double and scored on an infield hit by DeMirjian. In the fifth inning, the Dragons added three more runs, capped off by a two-run single by Collings, bringing Drexel’s lead to 10-0. Rider scored five runs in the bottom of the fifth, all off of junior pitcher Shyann Beach, who entered the game in relief for Taylor. Rider wouldn’t score any more runs after the fifth, and the Dragons emerged victorious 10-5. Collings had an outstanding nightcap, driving in a team-high two runs in four at-bats. She currently leads the Dragons with eight RBIs on the season and an improving .233 batting average. Parrish, Drexel’s leadoff hitter and leader in batting average (.316), had a good game as well, with two hits and three runs scored. The Dragons will travel to Auburn, Ala. March 9 to compete in the War Eagle Classic, hosted by Auburn University.